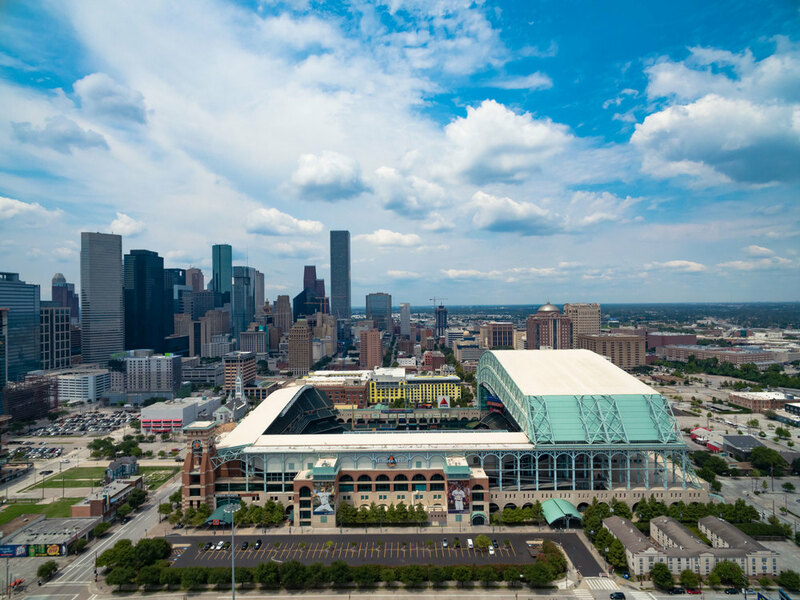 The Houston Sports Scene is a series I created of aerial photos that capture Houston's major sports venues while showcasing a view of the city. 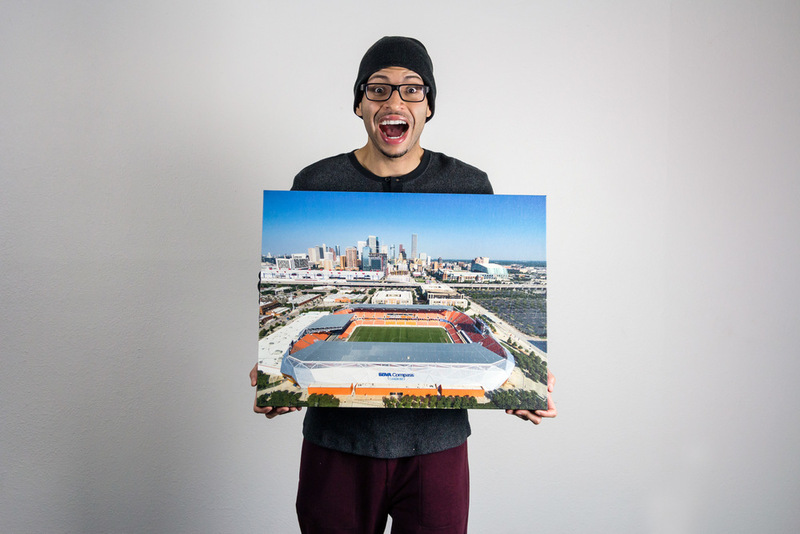 The goal of the series was to use photography as a medium to combine the love of one's hometown with the passion that sports brings, all in a perspective that most don't get to see. 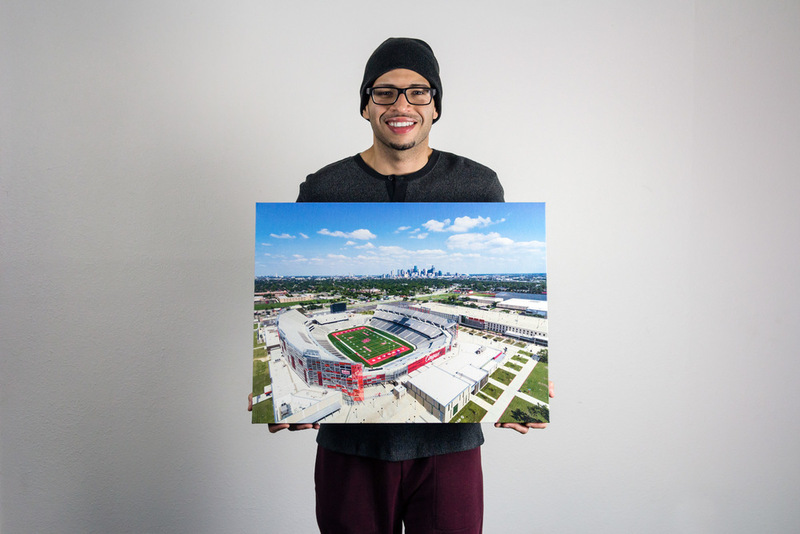 All of the photos in the Houston Sports Scene series were captured with a drone. Each photo was then created into a canvas print. 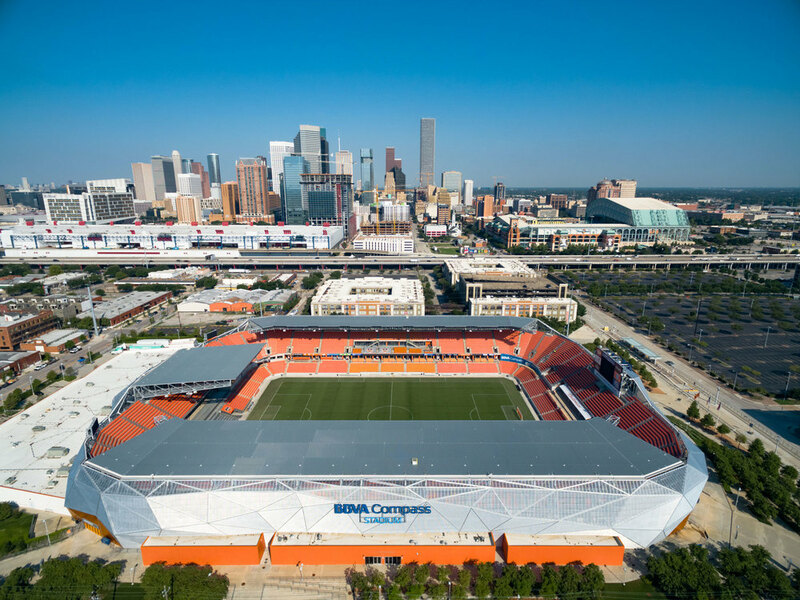 The 5 stadiums featured in this series are the Toyota Center, BBVA Compass Stadium, Minute Maid Park, Rice Stadium, and TDECU Stadium. However, this was not what I intended at first. 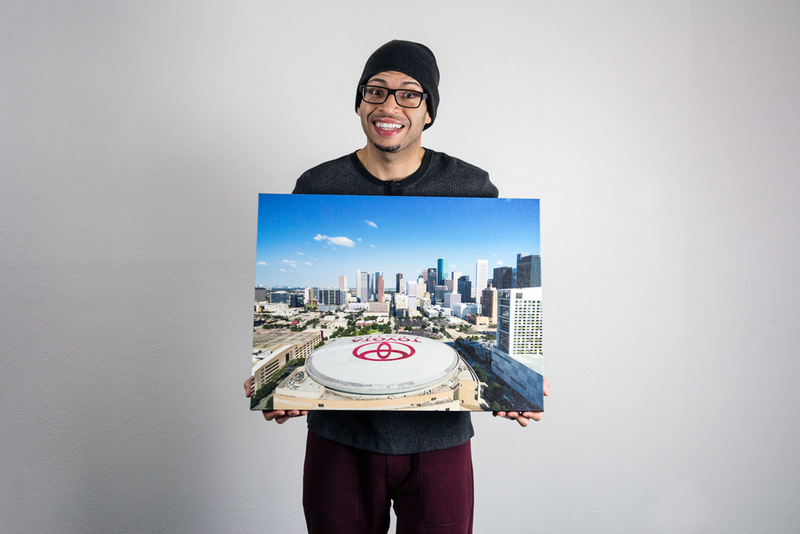 Originally, I planned the Houston Sports Scene to be 6 photos. I wanted to include NRG Stadium & the Astrodome in the series, as both have an important part in Houston sports. NRG Stadium is home to the NFL's Houston Texans football team. And, the Astrodome was home to the MLB's Houston Astros baseball team for over 40 years. I intended to capture them in one shot together. Unfortunately, I was unable to get a shot that I could include in the Houston Sports Scene series. I really tried to make it happen though. 6 different times to be exact. But, none of my efforts were successful. I had an idea of where I wanted to shoot the photo of NRG Stadium & the Astrodome but, as I drove up, I realized that location wasn't going to work. That wasn't much of a problem though because I quickly saw a better spot. As I was getting ready to park, I noticed that there was a lot of vehicles entering NRG Stadium's parking lot. That was strange to me because I figured the place would be empty. It turns out there was a high school football game taking place in a couple hours. For safety reasons, I really didn't want to fly over those people or vehicles. So, I checked NRG Stadium's schedule & realized there was no event taking place the next day. I decided it was best to just come back then & I left. I returned back to the NRG Park the next day. Everything went smoothly. I flew the drone from the location I decided on the day before & was able it get some shots of NRG Stadium & the Astrodome. I felt pretty good about it. Well... that was until I got home. Once I transferred the photos onto my computer & looked at them, I realized the shots of NRG Stadium & the Astrodome just didn't seem to fit in with the other photos in the series. I had misjudged the distance between the stadiums & the drone. I needed to compose the shot so that the stadiums filled more of the frame. To do this, I needed to fly the drone closer. Consequently, I decided that I could not use any of those photos for the Houston Sports Scene series. I had to reshoot so, I went back out there again. I knew I had to get closer to the stadiums. I get to NRG Park only to see 2 huge banners for Grambling State University & Alcorn State University hanging off the side of NRG Stadium. I was not happy. It turns out the SWAC Football Championship Game, which featured Grambling State University & Alcorn State University, was that weekend & banners for each school were hung off the stadium for promotional purposes. But, there was no way that I wanted those banners in my photo for the Houston Sports Scene. They would be too distracting & take away from the overall image. I decided not to even try to get a shot. I would just come back after that game was played & the banners were down. 4 Days Later, I was on my way back to NRG Park. The SWAC Championship Game was 2 days prior. I figured that I was enough time for the banners to come down. Well... I was wrong. The banners still hung from the side of the NRG Stadium. I was discontent. I really didn't want to have wasted another day. Uncertain of when the banners would even be taken down, I decided to go on with the photoshoot. I would just Photoshop the banners out of the image. It would mean more work for me but, my problem would be solved. I parked & walked to the location where I had planned to fly the drone. There was a man who worked at NRG Park near. Out of courtesy, I decided to go up to him & let him know what I was about to do. That conversation did not go as I expected. He immediately became agitated & threatened to call the cops on me. I really didn't want to deal with a conflict. So, I just left & avoided any potential problems. I began to doubt if I was going to be able to get this shot. I talked to one of my friends about the problems I was facing & how I was running out of options of where I could fly the drone. He mentioned a different location to me. Originally, I had ruled that placed out because I figured that it was too far away. But, with my options low, I decided to looked up that spot on Google Maps. Man, I was so glad that I was wrong. I could get a good shot from that location my friend mentioned. So, I went back out there the next day. As I drove up, I saw that the Grambling State & Alcorn banners had been taken down from NRG Stadium. YES! This attempt was already off to the great start. I got to location, prepared the drone for a flight, went to turn the drone on, and then my good spirits got crushed. The drone would not turn on. Its software was registering that I was in a No Fly Zone. When this occurs, as a safety feature, the drone will not turn on. This caught me completely off-guard. It was like if someone had sucker punched me straight in the face. I knew of all the No Fly Zone locations in the Houston area. None of them were even close to NRG Stadium. The doubts of whether I could even get this photo began to creep back into my mind. All of the struggles I faced were starting to add up & take a toll on me. But, I cleared my mind & just focused on trying to overcome this current obstacle I had in. New Plan! I'll find the edge of the No Fly Zone, get just outside of it, fly the drone straight up, and take a photo from there. I walked until the drone's software no longer read that I was in a No Fly Zone. With that, I was able finally to turn on the drone. I was feeling pretty good now. I began take off & in a fraction of a second, with the drone being just inches off the ground, mayhem occurs. The drone was out of control. It had tilted sideways & began flying laterally on its own. There wasn't much time to think but, I knew what my best option was to crash the drone into the ground. So... I crashed the drone into the ground. With the drone wrecked & turned off, I became flooded with every negative emotion possible. I was mad that the drone lost control like that. I upset thinking that I broke it & had wasted that money I spent on the drone. I was frustrated that after 5 tries I still didn't have one usable shot of NRG Stadium & the Astrodome. I knew that was it for me. I was done trying to get that shot. I was done with drones. I was done with trying to complete my Houston Sports Series. I was done with it all. I needed some time to cool down & clear my thoughts. Once that was done, I began to assess my damage. Luckily for me, the drone was still in good shape. The only things messed up were the propellers. And, that wasn't much of an issue because I had an extra set. I did a test flight & everything worked fine. But, I was still done with drones. I wanted nothing to do with them. I needed it & all the headaches it had caused me gone. I talked to my friend again & told him what had happened on my previous try. He was shocked at what had occurred & intrigued by the whole No Fly Zone situation. So, he looked into it. My friend found out that there was a No Fly Zone established around NRG Stadium & he sent me an image of the designated area. It turns out that the No Fly Zone was instituted in the time after my Try #2. With this new information, I started to try to rationalize everything that had happened. According to the image, the location of Try #5 was still within the No Fly Zone. Maybe that was why the drone went crazy on take off? That thought gave me a little hope that I might be able to get this shot after all. I used the No Fly Zone map to identify a location where I would be able to fly the drone safely. I decided then that I'll try one last time. So, I went to NRG Park for the 6th time. This time I knew exactly where the No Fly Zone was. I got to the spot & prepared the drone. To my disbelief, the drone's software still read that I was in the No Fly Zone. The image posted of the No Fly Zone was inaccurate. The zone was bigger than what was displayed. I moved further away, in search of a new spot. When I finally found one, I looked around to realize that there was way too many vehicles & people around. I could not risk the drone going crazy again from there. It just wasn't safe. And with that, I decided not to fly at all. And that was it. I tried 6 times & I failed 6 times. No more attempts to get that photo of NRG Stadium & the Astrodome after that. I was out of time. I had a deadline in place for when I wanted to release the Houston Sports Scene & could not delay a decision on the series anymore. Even without the photo of NRG Stadium & the Astrodome, I decided to release the other shots I had. The final Houston Sports Scene series is a result of me adapting due to the circumstances I faced. It is not what I originally planned but, I no longer feel like it is missing a piece. To me, the Houston Sport Scene series is complete as is.